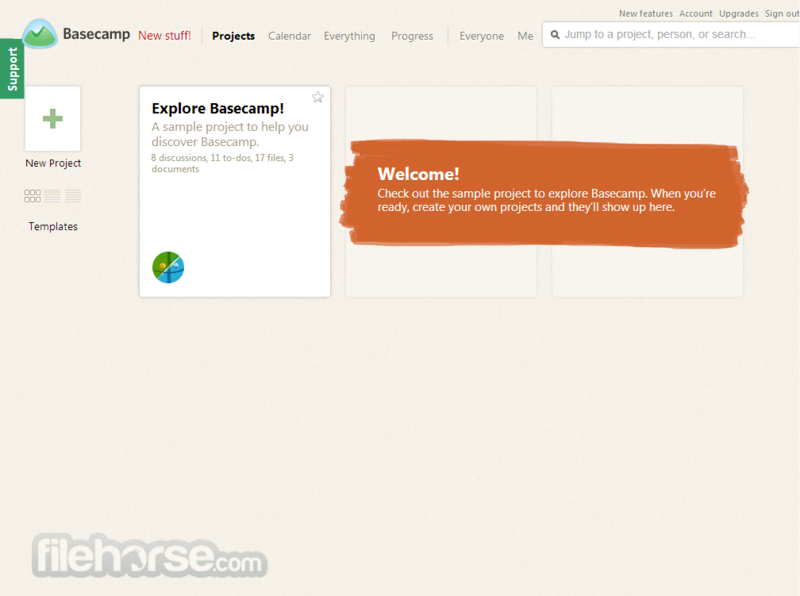 Basecamp is an online project management service that enables thousands of companies and millions of users to coordinate their work flow, interact on important project and track their appointments in one integrated, safe and highly intuitive environment. 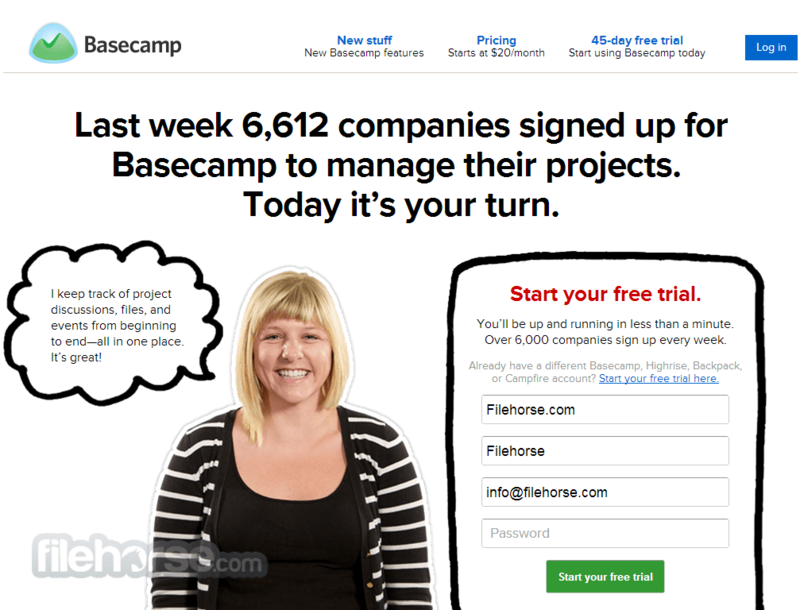 Basecamp offers a 45 day free tryout of all of their services, with a starting plan that cost only $20 per month. With it you can not only coordinate workflow in your large multinational company, but also use it for student projects, design agencies, freelancer jobs, to small party organizations. Your projects can be managed with easy, allowing transparent sharing of data between users who can quickly learn to use its options with very small learning curve. No matter how ambitious your project is, Basecam can provide you will access to the unlimited number of users without increasing the cost of subscription. Amazing project management software! With over 3 million active users, and thousands of subscribed companies, university groups and individual projects, Basecamp truly represent one of the best project management tools that can be found on the internet. Project management and work optimization web applications have become very popular with countless companies across the world, enabling them to dramatically increase their productivity and enable their workforce to micro-manage their tasks with ease. 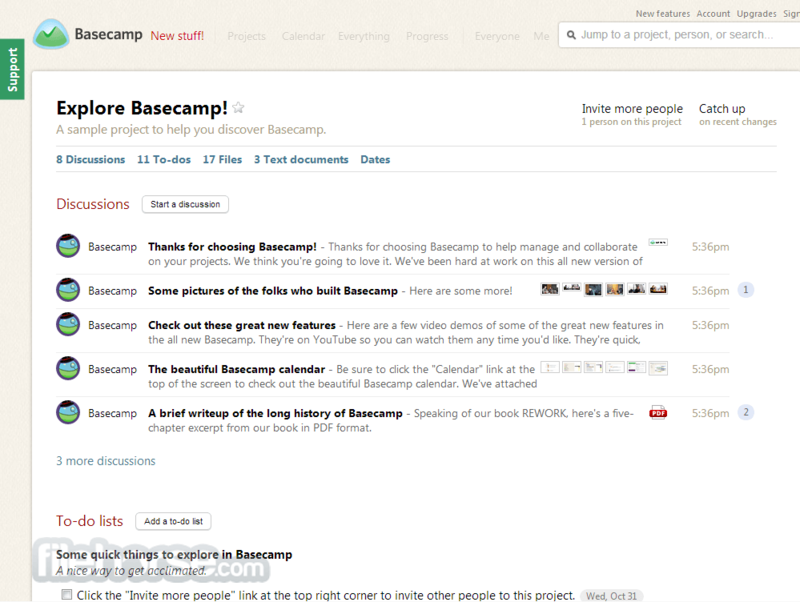 If you aim for best of those apps, then you have to see all that Basecamp can offer. 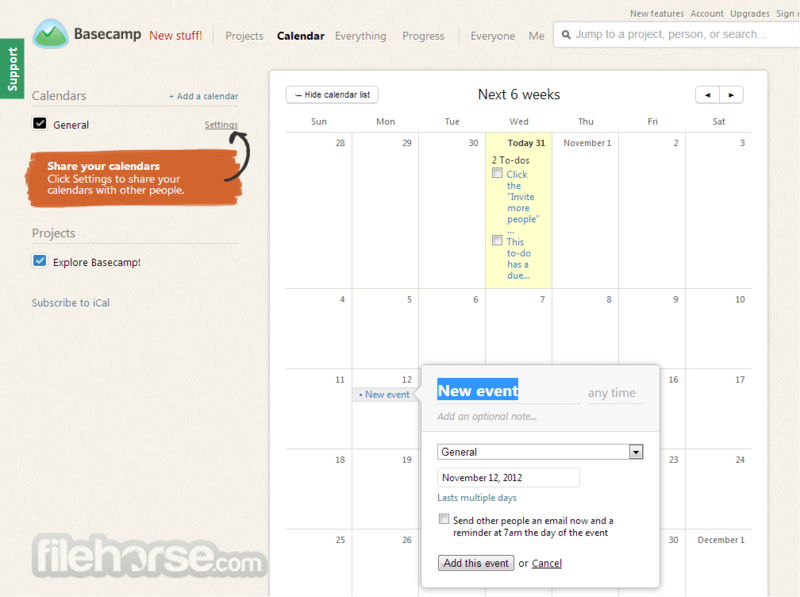 Basecamp is one of the most popular professional project management application, enabling over 285 thousand companies from all around the world to easily manage all the requests from their clients, create in-depth to-do lists for individuals and team members, integrate itself into work environment where users are already using different apps that can share their data between each other, and all of that even without the need to have a dedicated IT personal to manage deployment or upkeep. The core functionality of this app can be found in its tools for creation of to-do lists, management of milestone events, time tracking (with analytics that cover both individual users, teams and effort of entire company), messaging system, collaboration tools, calendar file sharing and wiki-style knowledge database. This and many other service enabled Basecamp to become one of the most popular productivity tools, enabling it to easily rise above its competition. Amazing project management software! Basecamp can be accessed easily via several supported platforms (web interface, iPhone, iPad, Android phones and tablets), enabling everyone to remain in constant contacts with their to-do lists, notifications, communication with colleagues, and file share services. Browser compatibility cover all popular apps, including all versions of Chrome, Firefox, Safari and Internet Explorer 9 and newer (app is fully compatible with Microsoft Surface tablet). With support for over 15 international languages, more than a decade of experience in serving some of the most largest companies and brands in the world (Nike, Adidas, WWF, NASA, National Geographic, Twitter, Fox Sports…), Basecamp represents the best app for you and your team. Basecamphas a very intuitive interface, which mixes white work areas and blue elements, mostly located at the top of the dashboard where main navigation tools are located. The based sections of the app are tabs for Overview, Messages, To-Do, Milestones, Whiteboards, Chat, Time, Files, People, Search and Permissions. This detailed breakdown of capabilities that is always accessible on top of the app serves an important purpose of enabling novices to very easily take full advantage from all tools and services this app offers. Mobile apps for phones and tablets have interface that is much more optimized for touch interactions. 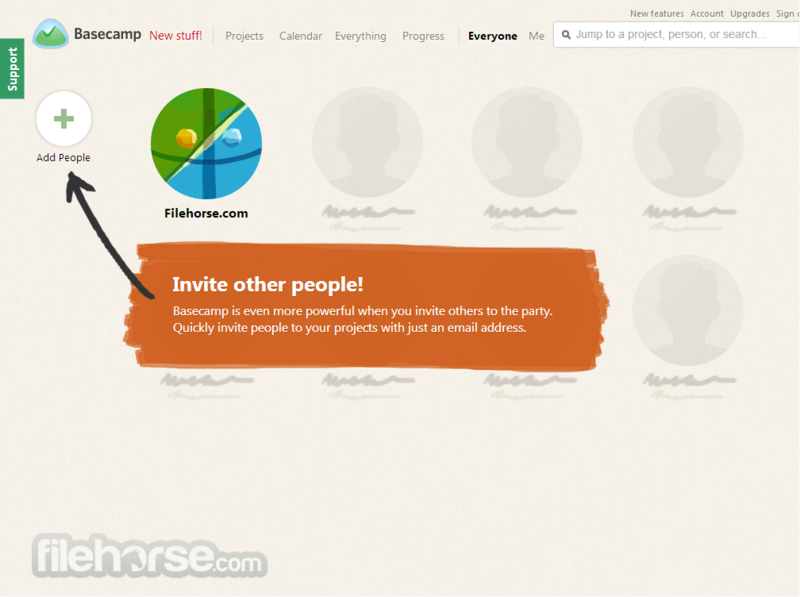 Basecamp is a premium-only app, enabling free access only if you can provide enough data so that you can be given “Basecamp for Teachers” account. Every other user needs to pick one of the monthly packages which all support unlimited amount of team members. Cheapest tier starts with $20/month that allows management of 10 active projects and 3 GB of online space, and can go up to $150/month for unlimited projects and 100 GB of online storage space. The most expensive tier of use is premium “Annual Package” that costs $3000 (unlimited projects, 500 GB of online space, priority support). Amazing project management software! Today, more than 10 years ago after first version of Basecamp was released to the public in 2004, more than 15 million people have used Basecamp both at home and at work, making it one of the most respected and widely used productivity and work management app in the world.